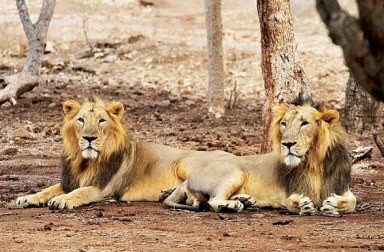 Gandhinagar: Alarmed over the Canine Distemper Virus (CDV) outbreak that claimed the lives of 23 Asiatic lions in their only abode Gir in Saurashtra, the Gujarat government on Tuesday launched a Rs 351-crore project for the conservation of the wild cat. The project also includes an emergency ambulance van akin to the 108 emergency service. The state government also put on hold approval to 10 mines in the Gir region in view of the environmental issues related to the eco-sensitive zones 10 km around Gir. Wildlife experts and forest officials have been complaining for long that mining and commercial activities around the lion sanctuary have increasingly become a threat to the tranquil existence of the wild beasts. The Minister informed that a special veterinary cadre of 120 personnel will be created for the conservation of lions. “We have also decided to upgrade and modernise eight rescue centres in the region, for which Rs 85 crore would be spent,” he added. Vasava said that an emergency ambulance specially dedicated to the wildlife would also be made available in the Gir region, just like the popular 108 services. This is besides setting up 32 rapid response teams. Modern technology would also be used in lion conservation, he said. “The movements of nocturnal animals like the lions and others will be tracked through closed circuit television cameras (CCTV) and camera-mounted drones. We are also planning to bring in a project on the lines of E-eye, which has been successful in the Corbett National Park,” Vasava added. The Minister made the announcements after a meeting of the State Board for Wildlife chaired by Chief Minister Vijay Rupani. It was also decided to set up five Safari Parks. Accordingly, a lion safari will come up at Gandhinagar, a Tiger Safari at Kevadia near the Statue of Unity and two leopard safari parks will be set up in Mandvi in Surat district and Dangs in South Gujarat. The forest Minister also informed that special breeding centres would be created for near-extinct bird species like the Great Indian Bustard and vultures.